Rangers manager Mark Warburton has again shot down striker Martyn Waghorn’s hopes of taking on Celtic. 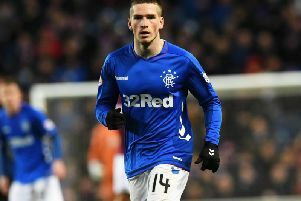 The Ibrox boss revealed last week that the forward’s knee injury would rule him out of this Sunday’s William Hill Scottish Cup semi-final. But Waghorn, 26, refused to throw in the towel and on Wednesday urged Warburton to give him a crack at the Ladbrokes Premiership champions-elect. However, Warburton has had to disappoint the former Sunderland, Leicester and Wigan frontman after insisting he would not risk his recovery by throwing him into action on the newly relaid Hampden turf. Waghorn has not featured since damaging ligaments on Kilmarnock’s plastic pitch back in February but has resumed light training. Speaking to the media in his final press conference ahead of the match, Warburton said: “Martyn Waghorn, as I’ve said many, many times, will not be fit for the semi-final. He’ll join us for training next week and be available for selection hopefully against Alloa. “Waggy has knocked on my door this morning. He’s a top-class pro and he’s been working so hard to try and get fit for the game. His absence is another blow to Rangers ahead of facing their old rivals. Playmaker Harry Forrester was counted out of the Old Firm battle after sustaining a hairline fracture in his leg during the Petrofac Training Cup romp over Peterhead. And with wingers Billy King and Michael O’Halloran cup tied, the Ibrox side’s attacking options appear thin on the ground. “I’d be lying if I said it wasn’t a blow to lose Harry,” admitted Warburton. “He’s been in good form for us. He offers us good flexibility.